Byerly Hall in Radcliffe Yard. Though the building opened in 1932, it now boasts a sophisticated geothermal heating and cooling system that saves energy and avoids burning fossil fuels. Photo courtesy of Flickr user FirstDaffodils. William Marks '12 and Nico Hawley-Weld '12 pose with a sample of Cambridge argillite after taking part in a presentation on geothermal energy on May 3. They were among 16 undergraduate students collaborating on a project for ES 96. Cambridge, Mass. - May 18, 2011 - Sixteen undergraduate students at the School of Engineering and Applied Sciences (SEAS) may now be Harvard's resident experts on geothermal energy. For their capstone project in the course ES 96: Engineering Design Seminar, these students conducted an in-depth analysis of the geothermal heating and cooling system that serves Radcliffe's Byerly Hall. Not only did the project provide new insights and tools for the expansion and maintenance of the system in years to come, but it also taught the students valuable practical lessons in engineering. 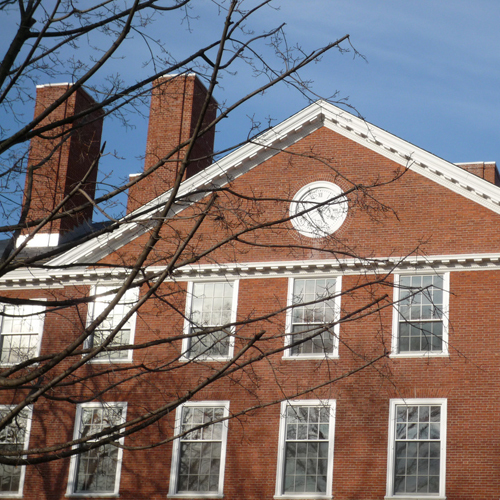 Their task, suggested by Barbara J. Grosz, Dean of the Radcliffe Institute for Advanced Study and Higgins Professor of Natural Sciences at SEAS, was to determine whether the existing geothermal wells in Radcliffe Yard could also supply energy to nearby Fay House without overwhelming the system. Through research, calculations, experimentation, and sophisticated computer modeling, the students have shown that, indeed, they can, and with only minor modifications. The students' finding comes as a relief to John Horst, Director of Operations at Radcliffe. Horst is leading a $13-million renovation of Fay House, which will involve updating all mechanical, electrical, plumbing, and life safety systems, improving accessibility, replacing windows, and reconfiguring some internal spaces. He wants to replace the conventional heating and cooling systems, which rely on fossil fuels, with an energy-efficient geothermal system, without having to drill new wells. The students' results confirmed an earlier finding by engineering consulting firm Haley & Aldrich—that the Byerly Hall wells could handle the additional load—but also took the investigation several steps further, creating analytical tools that may improve performance and efficiency in the long term. First, they developed a model of energy requirements in Fay House using Simulink and MATLAB, taking into account variable factors such as occupancy, the outside temperature, and the amount of cloud cover. Another model simulated the performance of the heat pumps, the devices that would transfer heat between the geothermal wells and the building. This question of above-ground supply and demand, though, was just the beginning. The students also needed to know how much capacity each well has to supply or accept heat. That depends on conduction and advection within the wells—both of which depend, in turn, on the geology of the Cambridge argillite that lies 1500 feet below Radcliffe Yard. Studying the subject literally "in depth," the students consulted geologists and learned how fissures in the rock can let groundwater seep into the well, affecting its efficiency. Soon, they had created another model in COMSOL to quantify heat transfer over a cross section of one well. To verify that the model was reliable, the students then conducted a stress test on an actual well. Another experiment involved adding a dye to the system and measuring its concentration to quantify advection over short and long periods of time. As a result, they found that if three heat pumps are added to the system, the five existing wells that service Byerly Hall can also cover Fay House. The students also recommended that for optimal efficiency the wells should all run simultaneously for the 15-hour day (rather than in shifts) and the building's thermostats should be raised gradually over the course of each morning. "It's terrific," says Horst. "I think they did a great job; I'm really impressed by how well they got into the issues." He plans to request funding for a work-study student to monitor the system using the new models, including one that can use meteorological forecasts to predict the system's performance and efficiency ahead of time, potentially averting problems. "That forecasting is really quite stunning," says Yang, Gordon McKay Professor of Electrical Engineering and Computer Science. "You can tell, if there's going to be a cold snap, are you going to freeze your wells?" Horst is also hopeful that the U.S. Department of Energy might take an interest. "I would love to do some follow-up studies on this," he adds. "This class was a completely new experience for me in many ways," says Erfan Soliman '12. "I don't think I have ever taken a class that pulled together so many different aspects of my engineering education so far, and put them to use in the context of a real problem." That's exactly the goal, says instructor Kevin Kit Parker, the Thomas D. Cabot Associate Professor of Applied Science and Associate Professor of Biomedical Engineering. Students taking this course in the spring of their junior year have the opportunity to test their skills and identify their weaknesses; then, they have one more year to close the gap. "This class is not really a class," Parker says. "It's a twice-weekly meeting of a new consultant group. When we think of a class and instruction, one typically considers that the path is charted on Day 1 and the right answers are known." "This is a different experience." The course was co-taught—or advised, one might say—in two sections, by Yang, Parker, Robert D. Howe (Abbott and James Lawrence Professor of Engineering) and Visiting Lecturer Barry Griffin '71. Nico Hawley-Weld ’12 estimates that by the second half of term, he was spending 20 to 30 hours a week on this project. The instructors provided what they describe as “coaching” support, but the students largely took it upon themselves to meet with expert engineers, scientists, and local officials. "They pushed us pretty hard, but we were the ones who decided this project was worth our time," Hawley-Weld says. "I went from just showing up in class to thinking that it was the most important thing in the world." That dedication was evident at the students' final presentation on May 3. "One of the geothermal experts who came to our presentation said [afterward] that there had never been 20 people in a room who knew so much about open-loop geothermal wells," says Hawley-Weld. ES 96, SEAS' capstone engineering course, has evolved over more than 20 years into its current format, but projects relating to energy efficiency and "green" thinking are common. Another team of students inthe course this semester designed new tools for local organic farms. "I am proud of the way the class performed," says Parker. "We were tough on them. They realized that it is not personal, it's business, and that the primary deliverable that we are driving towards is a cadre of engineering students who know how to step into the gap of the unknown and start to fill it." This animated model, produced by students in ES 96, provides a tour of the existing geothermal energy system that heats and cools Byerly Hall in Radcliffe Yard. To watch the video in full-screen mode, click the arrows at bottom right. Geothermal energy is the natural heat that is stored deep underground (about 1500 feet down, in the case of the wells at Radcliffe). While the seasons change above ground in Cambridge, the temperature at this depth remains between 47 and 57 degrees Fahrenheit. In winter, the energy from the rocks can be used as a source of heat for campus buildings, as water from deep wells brings warmth up to heat pumps at the surface. In summer, the reverse takes place; the wells act as a heat sink, cooling the buildings. Geothermal heating and cooling systems are environmentally friendly because they reduce the demand for fossil fuels. two at 46 Blackstone St.
three at 90 Mt. Auburn St.